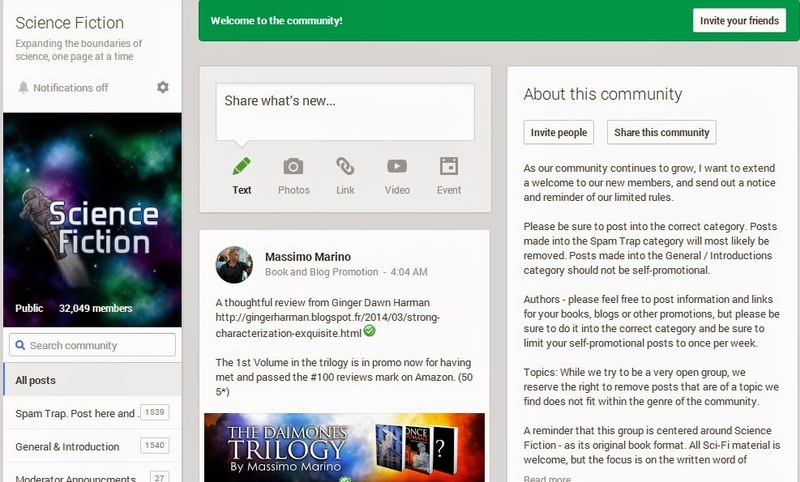 Deep Thoughts from an Author's Cave: Google+ 101: I have a profile...now what do I do? Vol. #3. Google+ 101: I have a profile...now what do I do? Vol. #3. So, if you have been following my new series of blogs about Google+, you should have already created your Gmail account and Google+ profile. You also should have a pretty good sense of how to navigate the menus on the landing page of Google+. Now, it's time to start connecting with people. In order to get followers, you need to follow first. You can't just throw yourself out in the crowd and stand there with your head shrunk in. You have to jump up and down and wave your hand. "I'm over here...and I'm interesting." On your Google+ home page, you should see this at the top. To search for people, profiles and pages that are interesting to you, type a keyword(s) into the search bar. For this example, I have entered "science fiction" into the search bar (since I write young adult / science fiction). The following image is what will come up. 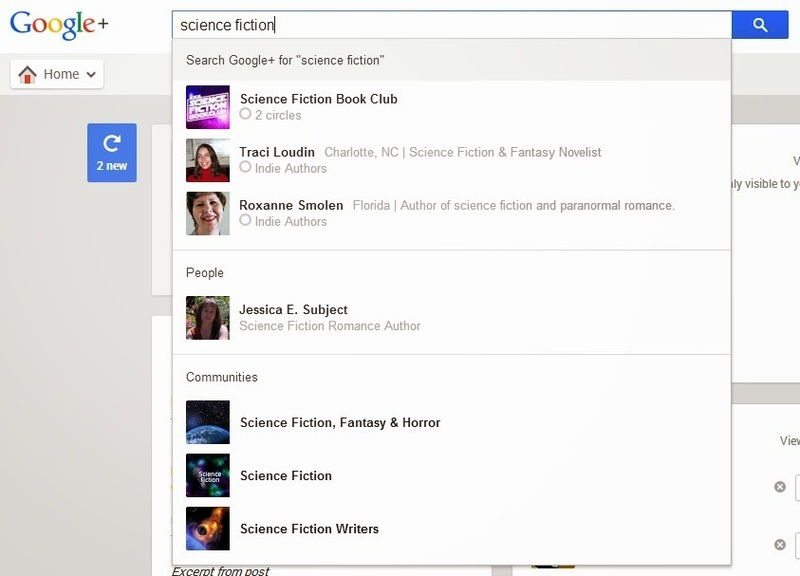 "Science Fiction Book Club" is the first search result. That sounds interesting. I can probably meet some readers via that page. Which brings me to this... pages are similar to Facebook pages, but they can do much more. I will cover building your own page in a future Google+ 101 post. After I click on the result I want, I click the "Add" button and the little pop up box appears. By default, I already have following, friends, family and acquaintances categories that I can file this page under. I want to follow them and I think there might be readers there, so I click the box with "Following" and then I create new circle for "Readers" and check that box. If you look back up to the original menu bar in this post, beneath the search bar, you see All, Friends, Family, Acquaintances, More and Explore. If I only want to see posts from the people I have tagged as Friends, then I can click on Friends on that menu bar. If I click on More, I will open up the other circle categories that I have added. If I only want to see posts created by readers, then I will click "Readers". STEP 1: Now, for the fun stuff. Notice on the page where it says "In their circles" and there are 2,252 people. These people have an interest in science fiction. They might also like my book. I can click on "Add" and then place them in a "Following" or "Reader" circle, whatever I choose. Please note though that Google+ will limit how many people you can add each day, but it's quite a lot. ...many times, when I follow someone, they will follow me back. Now, what do I do with that? Do I blast them with my book 24 times a day? NO! But, I do go to YouTube or search the web looking for cool articles or videos about space, aliens, future technology, time travel, etc and I post those types of things. STEP 2: The next thing you want to do is scroll around on their page and look at their posts. If you find one you like, then click the +1 button, or better yet, reshare it. They will be notified when you perform either action, and oh, they may follow you. If they follow you, then they will see your posts and so may their extended circles. They may +1 and reshare you! 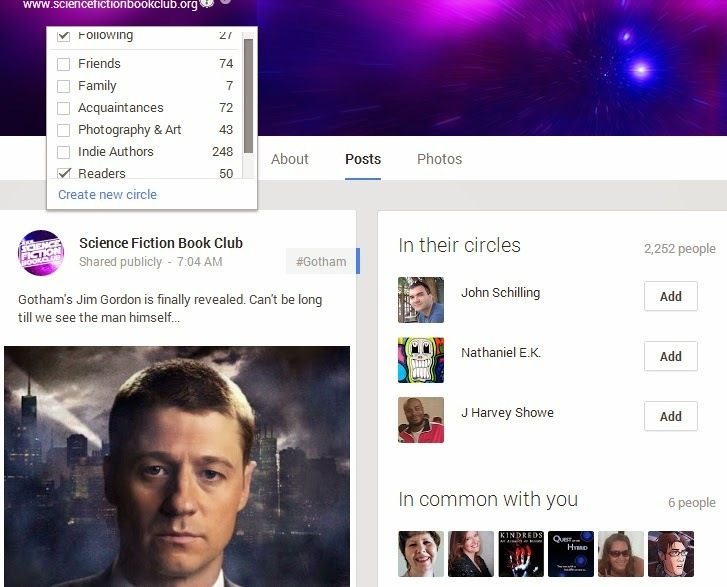 STEP 3: Now, the next grouping of search results are for Communities. This is where you can really start to interact with people drawn together by a common interest. If I click on the Science Fiction community, their landing page comes up. Each community will have their "About" section. Please do yourself a favor and read their rules-especially their policy on spamming books, or other products you may be trying to sell. you can make that change by clicking on the switch located directly above the graphic. This is the part I love about Google+ communities over Facebook groups. Notice below the graphic for the community, there are categories: All posts, Spam Trap Post here..., General & Introduction, etc. Anytime someone posts inside this community, they are forced to choose a category for their post. Yes! As a moderator of a community, you can add whatever categories as you want. In my Book Review Depot community, we have tons of categories. Grammar and Punctuation Tips, Book Trailers, Reviews, Marketing Tips, Writing Tips, etc. If someone wants to see if there is help for whether to use "lay" or "lie", they can look in the Grammar & Punctuation folder. Sure enough, there is a post with a link to an article about "lay" and "lie". (Oh, and the articles is saved in my Google Drive, completely connected and I can control who can see it, edit it, etc.) This makes posts much easier to find when looking for something specific. It also means a new member can easily enjoy a post that may have been made 3 months ago. STEP 4: Your homework assignment is to go into your Google+ and search for at least three keywords that represent your interests. Click on the pages, profiles and communities that come up in your search. Follow them, or create a special circle for them. Also, click on five to ten of the people that are following them and add them to your circles as well. STEP 5: Return to your "Home Page" and you will see the posts made by the people that you have chosen to follow or add to your circles. p.s. if you enjoyed this post, please click the +1 button just below here so that others may enjoy this post, too! Actually, I think advising people to follow strangers is the wrong strategy to follow. They should first genuinely interact in the communities that they join. I follow those who interact with me. It's less cold calling and it establishes a growing relationship with these people. Take an interest in someone and you won't have to market, you won't have to spam. People should be focusing on developing genuine relationships with people and the best way to do that, which you have hit on, is to target common interests. Ooops I guess I should have clarified further. Follow people you are finding in interest groups, or that have pages of interests that you are into - not just random strangers that you have no perceived connection with.